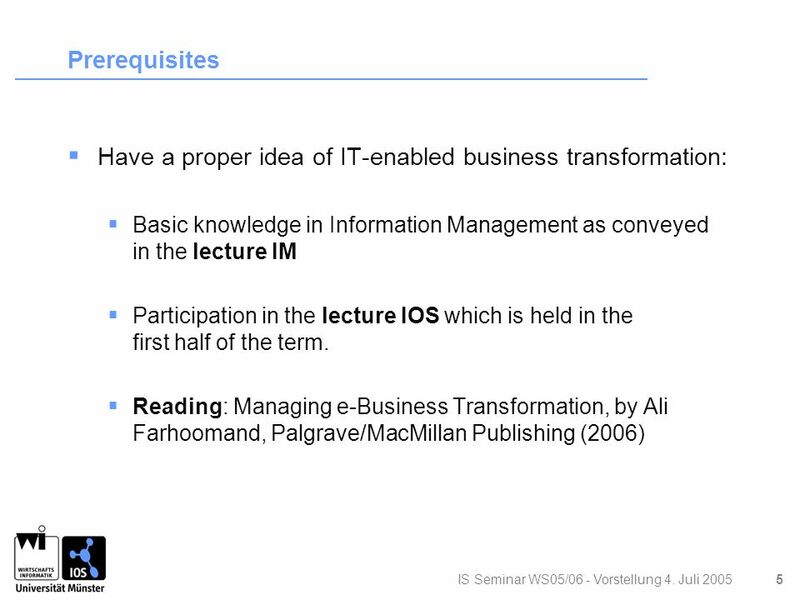 Wirtschaftsinformatik Prof. A. Farhoomand, Dr. A. Teubner, Prof. S. Klein Chair for Information Systems and Interorganisational Systems Department for. 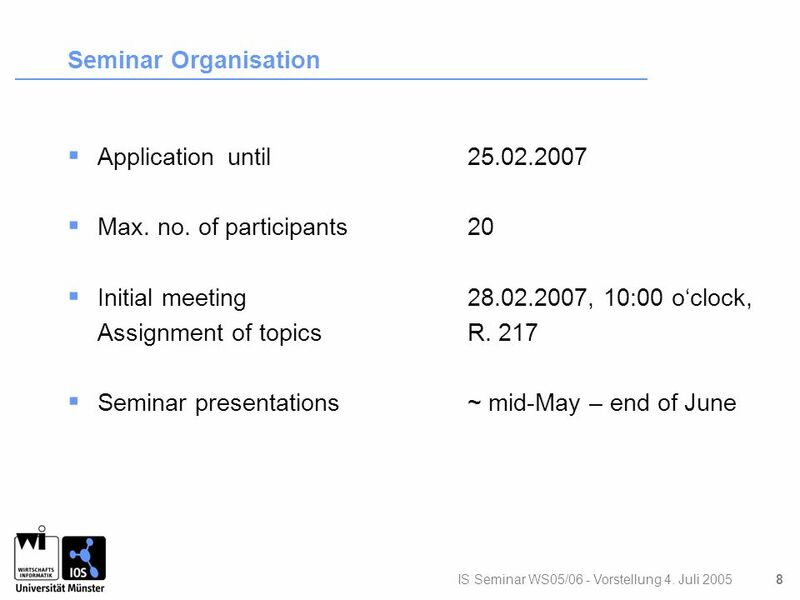 2 IS Seminar WS05/06 - Vorstellung 4. 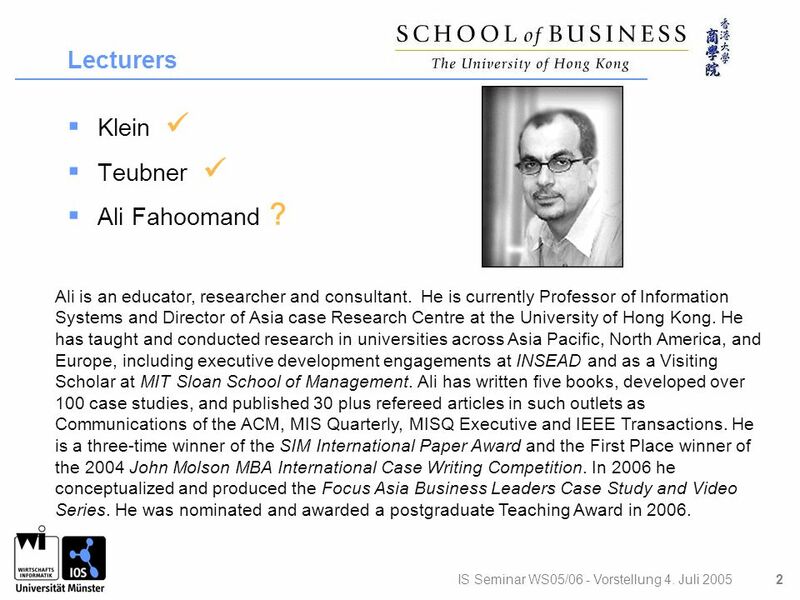 Juli 2005 2 Lecturers  Klein  Teubner  Ali Fahoomand ? Ali is an educator, researcher and consultant. He is currently Professor of Information Systems and Director of Asia case Research Centre at the University of Hong Kong. He has taught and conducted research in universities across Asia Pacific, North America, and Europe, including executive development engagements at INSEAD and as a Visiting Scholar at MIT Sloan School of Management. Ali has written five books, developed over 100 case studies, and published 30 plus refereed articles in such outlets as Communications of the ACM, MIS Quarterly, MISQ Executive and IEEE Transactions. He is a three-time winner of the SIM International Paper Award and the First Place winner of the 2004 John Molson MBA International Case Writing Competition. In 2006 he conceptualized and produced the Focus Asia Business Leaders Case Study and Video Series. He was nominated and awarded a postgraduate Teaching Award in 2006. 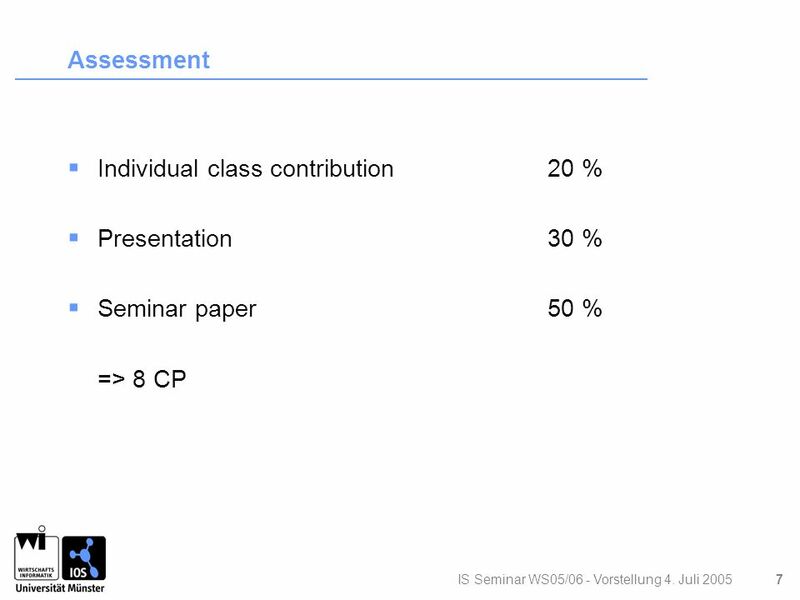 3 IS Seminar WS05/06 - Vorstellung 4. Juli 2005 3 Objectives  To learn about theories which can help to explain how IT facilitates the transformation of the economy on different levels (industry, network, enterprise).  To be able to apply these theories in the analysis of concrete business problems.  To be able to articulate and make a business case. 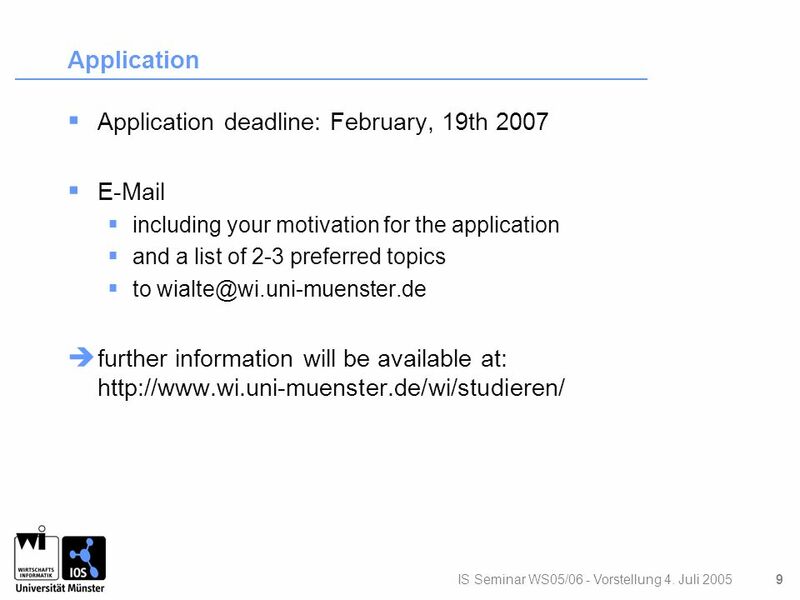 4 IS Seminar WS05/06 - Vorstellung 4. Juli 2005 4 Learning Goals  To study the interlinks among business strategy, technology, and processes  To gain an understanding of the issues surrounding innovation, change management and organizational adoption  To learn how to gain strategic leverage from the global IT infrastructures using the concept of network effect and its applications in a firm’s strategy formulation and execution processes  To study the role of global IT infrastructures in compressing spatial and temporal constraints, shortening of the business transaction cycle, and enhancing market efficiency  To understand major regulatory, legal and international issues in the marketspace  To learn how to identify major business issues, find relevant information, outline credible alternatives, and logically build and articulate convincing argument in support of a particular course of action. 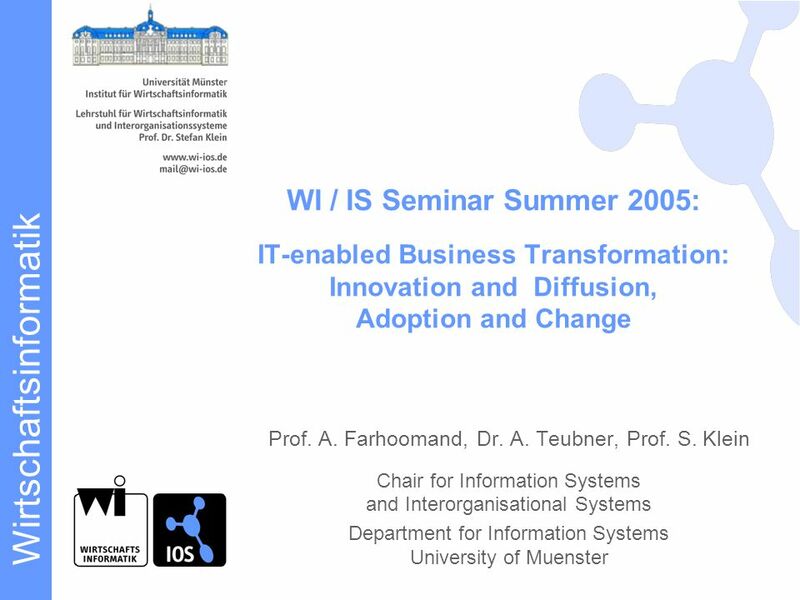 Download ppt "Wirtschaftsinformatik Prof. A. Farhoomand, Dr. A. Teubner, Prof. S. Klein Chair for Information Systems and Interorganisational Systems Department for." 1 Moving Upstream in Developing an e-Education Strategy Prof. Doug Vogel Dr. David Mole City University of Hong Kong. A Masters in Education in eLearning The University of Hull. ICCE 2010 Special Session A Meet the Associate Editors of Research and Practice in Technology Enhanced Learning (RPTEL) Dr. Siu Cheung KONG Prof. Fu-Yun. NGOs in World Politics  Since the end of the Cold War, there has been increased scholarly and policy attention to the role of non-governmental organisations. Angela Chow Centre for Information Technology in Education The University of Hong Kong IT in Education Symposium, 10th July, 04. City University of Hong Kong Department of Management BBA-BM Briefing Session on Specialized Area and Foundation Courses (January 21, 2013) by Syed Akhtar. Template. 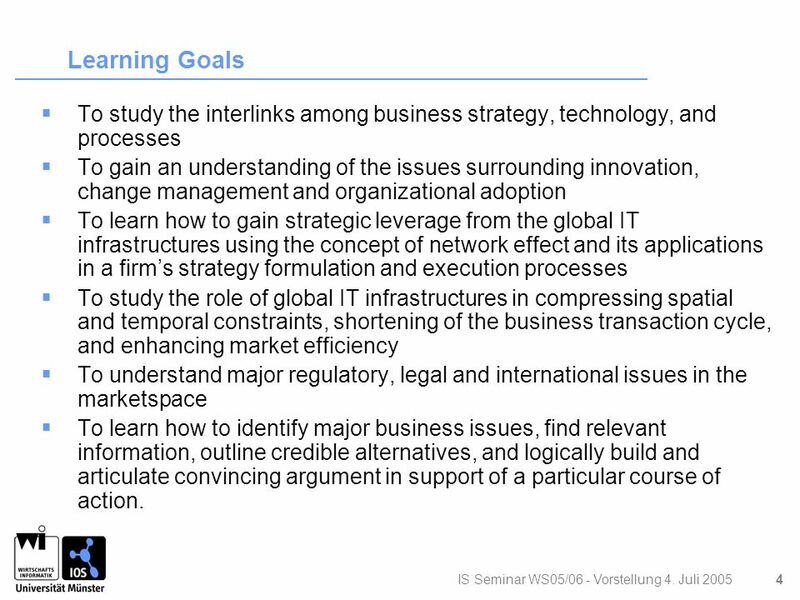 2 2 Slide Title to go here INTRODUCTION Supply chain management issues are permeating every business in the modern world. It’s a whole new world. 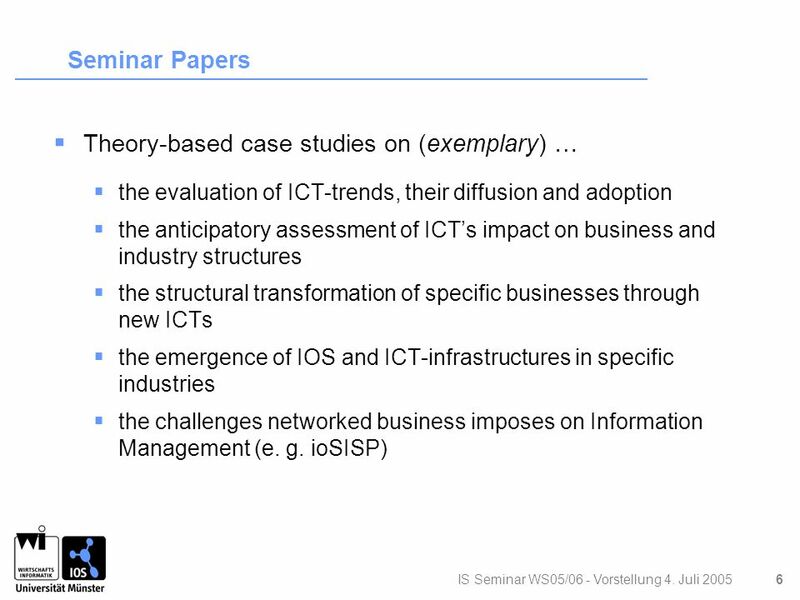 The impact of ICT on tertiary education: advances and promises by Kurt Larsen and Stéphan Vincent-Lancrin Centre for Educational Research and Innovation. The Skills Gap – A View from University Alan Murray PhD Leeds University Business School Presentation at The University of York October 2011. Human Resource Champions: The Next Agenda for Adding Value and Delivering Results Presented by Ivan Chang. International Business Global Corporate Strategy: Porter’s theory of national competitive advantage in industries. Information Seminar February 21, Rundown Program Introduction by Prof. Rachel Zhang Sharing by Alumni / Participants Q&A. Developing Human Resources Presentation to UST MGTO HRM Students 5th March th March 2007. Research Trends in Software Engineering – CS661 Shafay Shamail Malik Jahan Khan. Transforming Marketing Developing marketing excellence Proposal to develop and deliver marketing excellence by Cambridge Marketing College.